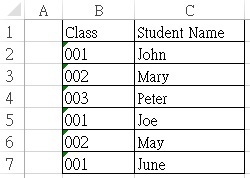 This tutorial explains how to write a custom VBA Excel Function to vlookup second matched value or specific occurrence. In traditional Vlookup, you are allowed to vertically lookup the first value that matched the criteria (first occurrence), but you cannot lookup the second value, third value, forth value, etc. In view of this issue, I wrote a custom VBA Excel Function that is capable of vlookup the second value, third value, or any value that you specify (the Nth occurrence). The syntax of wlookup is basically same as Vlookup, except that I replace the last parameter to Nth occurance. This Function returns “no match” instead of #N/A if no result is found. Please note that I have not handled much exceptions in the Function, and I do not guarantee this Function is flawless. Press ALT+F11, copy and paste the below bode in a Module. Note that I have written three Functions. Assume that you have the below data source.